This is our final newsletter for the year. As 2018 draws to a close, and the rejuvenated SIEF portfolio of programs celebrates nine years of ongoing support of the National Innovation System it is pleasing to provide an update on recent SIEF highlights. In June, eight SIEF-AAS Fellows attended the 68th Lindau Nobel Laureates meeting with Nobel laureates from the field of physiology or medicine. This highly competitive program is supported financially by SIEF and facilitated by the Australian Academy of Science. For the nominated SIEF-AAS Fellows, this was a once in a lifetime opportunity to meet and be mentored by Nobel laureates, and engage with other outstanding early career researchers from around the world. A report on the meeting has been published by the Australian Academy of Science, highlighting how attending the meeting was a fantastic experience for the SIEF-AAS Fellows. 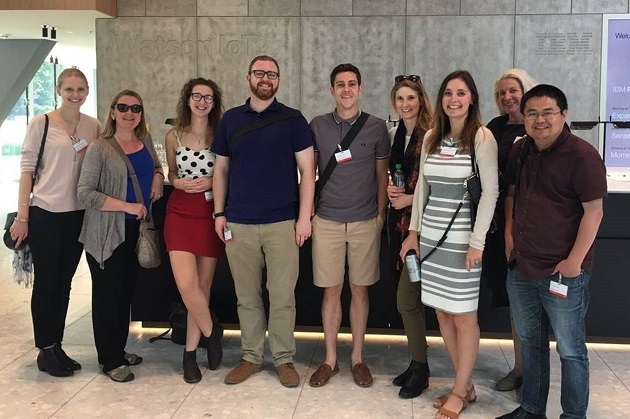 The SIEF-AAS Lindau Fellows at IBM Watson Internet ofThings campus in Munich, including delegation leader Prof Jennifer Martin (second from left) and Felicity Jones (second from right) from the University of Melbourne. Source: Australian Academy of Science. It has been a busy time for SIEF as a number of exciting and innovative Experimental Development Projects (EDP) come to a close, and another commences. Since the program’s launch in 2016, eleven projects have been funded. de-risks for future commercial investors. Publicly Funded Research Agencies (PRFAs) within the Australian Government’s Industry, Innovation and Science portfolio are eligible to apply as Lead Applicants (AIMS, ANSTO, CSIRO, GeoScience Australia). Eligible PFRAs who may be considering submitting a proposal MUST contact SIEF to discuss their projects and key aspects, including eligibility, prior to development of their proposal. Further information about the Experimental Development Program can be found on the SIEF website. In this edition we highlight three Experimental Development Projects that have reached milestones recently. Demonstration plant to validate new products for gold recovery (Going for Gold). SIEF funding was used to construct and operate a mobile pilot plant to demonstrate gold recovery using proprietary non-toxic products developed by the research team, at an industry acceptable scale. This was achieved through collaboration with industry partner Eco Minerals Research. The project successfully validated the products’ performance to recover gold, at an economical rate. The project has significantly accelerated the path to commercialisation for uptake by small professional miners with high grade gold deposits. A media release was published in August 2018 that highlighted a major milestone of the project. A gold ingot was produced from the first gold extracted by the demonstration plant. Commercial demonstration of megasonic technology for additional virgin olive oil recovery (Megasonics). With the support of SIEF funding the Megasonics project has demonstrated that ultrasound technology can increase the oil recovery from olive paste compared with non-ultrasound treated olive paste at an industrial level up to 3 tonnes per hour. The project outcomes offer olive oil producers greater efficiencies in the production of olive oil while maintaining oil quality and reducing processing costs. Some of these efficiencies include additional oil recovery in presence of enzyme adjuvants, and decreased malaxation time. An additional benefit of the successful proof of concept is the expansion of the technology to other feedstocks. CSIRO’s Lead Researcher for the Megasonics EDP – Pablo Juliano – was nominated and shortlisted for the 2019 Eureka Prize for Innovative use of Ultrasound Technology for Edible Oil Extraction, sponsored by the Australian Museum. Funding has recently been approved for the EDP project Enabling Australia’s Carbon Fibre Industry (Carbon Fibre). In a market dominated by a few major carbon fibre manufacturers, smaller or innovative companies, especially those in emerging industries, have difficulty identifying and securing carbon fibre with the property and performance specifications to suit their needs. Using RAFT polymerisation technology, varying grades and performance specification of carbon fibres can be produced by tailoring the carbon fibre to create better quality fibres with higher strength and stiffness than comparable grades currently available. The objective of this EDP is to demonstrate that the technology can be scaled up to produce carbon fibres to specifications and quantify the benefits and advantages of using RAFT derived materials compared to conventional materials. The SIEF Annual Report has been published as part of CSIRO’s annual report. As 2018 draws to a close, we thank you for your ongoing support and interest in SIEF. The SIEF Office will be closed from 21 December until 2 January 2019. We wish you a safe and happy festive season and look forward to continuing our support of Australian science and industry in 2019 and beyond.